To open 3+ miles of salmon habitat previously blocked. North of Nikiski, one hits the end of the road at Captain Cook State Park. Two remote subdivisions without road service are reached by ATVs traveling along a shared pipeline and right-of-way easement. This access route crosses several salmon bearing streams, the first of which is Leif Creek, about 4 miles out. A flattened culvert completely blocked the stream during low water. 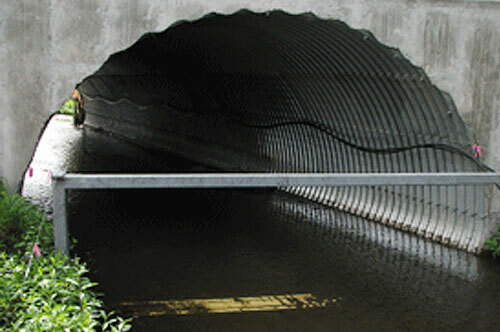 In the early fall of 2005, several hundred adult salmon returning to spawn were blocked by the culvert. KWF removed the culvert and replaced it with a bridge in Spring 2007. In the summer of 2003 and 2004 the Kenai Watershed Forum (KWF) more closely evaluated each of the three problem road crossings. It was clear that the College Loop Road presented the greatest potential to block juvenile anadromous fish. The culvert at this crossing had been so badly crushed that parts of it were sticking up through the road surface and it was too narrow compared to the normal width of the stream. To avoid the jagged culvert, drivers were illegally trudging through the salmon stream, destroying habitat for spawning and rearing.